Smoothies have been my go-to breakfast for some time now. I love that they are a simple, delicious way to start your day. So naturally I had to try out the smoothie bowl that has been the latest phenomenon. I have been creating different combinations of all my favourite fruit and I have to admit they live up to all the hype. 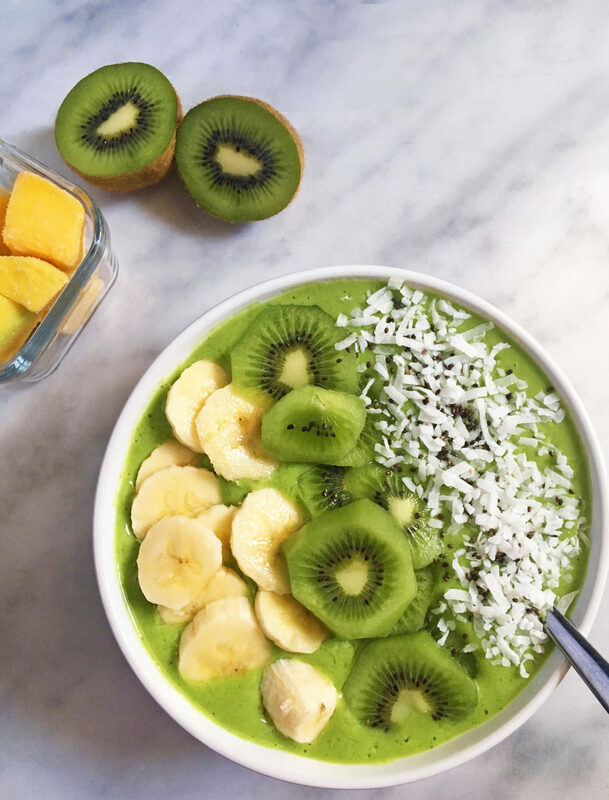 I typically gravitate towards all things green as they tend to be light and fresh…like this Kiwi-Mango bowl. It’s sweet, slightly tangy and packed full of nutrition which helps to keep you full for hours. And it’s completely dairy-free for all my vegan friends out there! Combine all ingredients in a blender, finish with toppings. Let set in freezer or enjoy as is! Feel free to change up toppings, simple granola works great too!